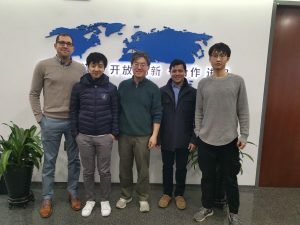 This week, while some of the western team continued their trip in China, Elastos joined the International Grouping and Resource Sharing Industry Association, appointed a Community Manager, published Rong Chen’s first round of answers to community questions, and continued to make great technical progress. 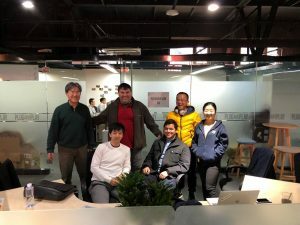 Looking for an ioeX update? Founder Aryan Hung provides a lengthy one in this week’s report. 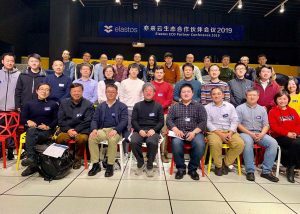 While some of the most prominent projects over the last year now look to not continue their development any further, the Elastos team continues to push forward with yet more development updates as we approach Chinese New Year. Elastos Runtime receives lots of updates regarding providing support for built-in applications and to unify the API for all the different Elastos services into Trinity, allowing developers to only worry about one set of APIs to interact with the entire Elastos ecosystem. 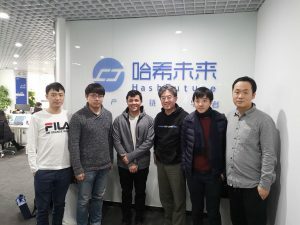 Having a unified API in Trinity will help developers to develop their applications interacting with Elastos Carrier, Elastos storage, DID sidechain, token sidechain, decentralized exchange, etc all under one set of APIs instead of having to learn different sets of APIs, which is not ideal. In other news, Elastos Storage, the most important component of Trinity browser and the entire Elastos ecosystem, continues its development so it can be released as soon as possible. 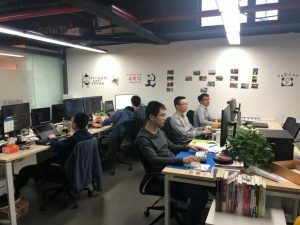 Elastos Carrier undergoes some optimizations including the ability to do file transfer and offline messaging. DPoS consensus mechanism will first be adding 12 arbitrators into the overall AuxPoW + DPoS consensus that Elastos main chain employs. 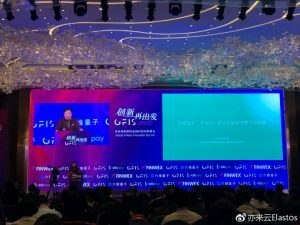 After this is complete, merged mining will be open to everyone which means anyone is able to start merge mining with Elastos in addition to btc.com mining pool. 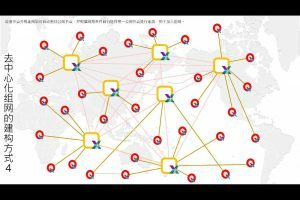 Sometime after that, the DPoS will go live completely at which point there will be a total of 108 supernodes, of which 36 supernodes will be used for signing blocks as part of the Elastos main chain consensus mechanism. Elastos main chain is being upgraded to support voting functionalities. A lot of bugs were fixed for Mobile SPV wallet that was released back in December 2018. The iOS version of this wallet is scheduled to be released very soon. Both the Android and iOS version of the mobile SPV wallet will also have voting functionalities added in addition to the voting being available through the web wallet. 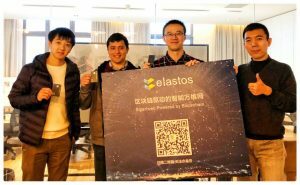 The Elastos Foundation has attempted to make contact with Bitmain regarding the distribution of ELA and miners themselves can also contact BTC.com directly. 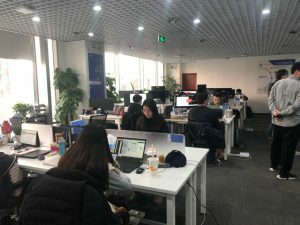 The Elastos Foundation sent inquiries as early as October of 2018. BTC.com replied at that time that they needed to upgrade the front-end software and ajdust their payment system accordingly. 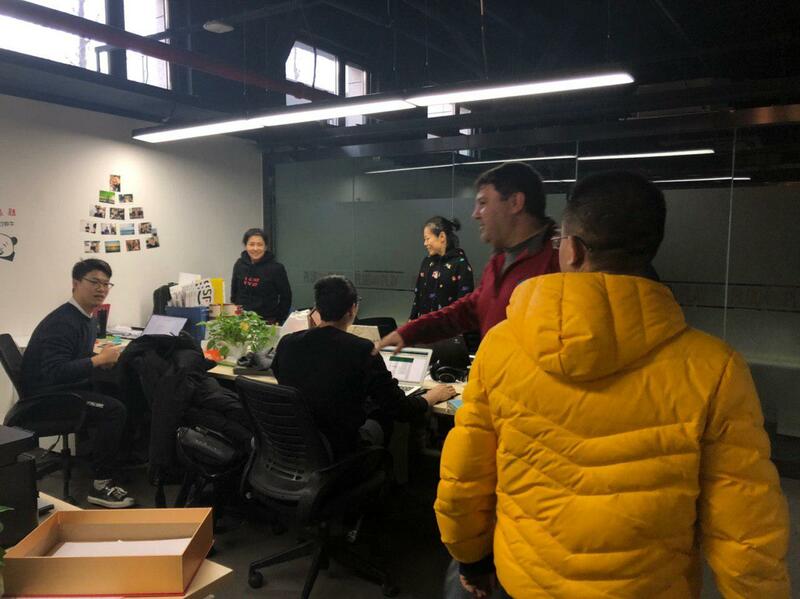 The Elastos Foundation will continue contacting BTC.com regarding this matter. At this point in time, we are not able to promise the outcome. We are deeply sorry and disappointed in the current situation with BTC.com. We will actively search for alternative mining pools and launch open merged mining as soon as the DPoS layer releases. *Update 1.18.19 – A previous version of this article incorrectly stated in the estimated timeline for merged mining that it will be open publicly in August 2019. This has been amended to reflect a more accurate date of April 2019. 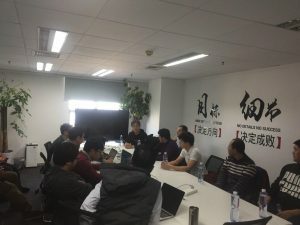 IoeX founder and CEO Aryan Hung was a guest on Elastos Talk in the Chinese Telegram group, where he shared a segment titled “ioeX Network Architecture and Areas for Practical Application.” Read Aryan’s talk below. Three members of the western team, Donnie Bullers, Kiran Pachhai, and Clarence Liu, are currently visiting the Elastos offices in China and also taking tours of several ecosystem partner offices. Rong Chen extended the invitation for general foundation discussions and strategy meetings, but also to allow western team members to see first hand the significant progress of Elastos and the ecosystem at large. Aryan Hung is the founder and Director of Operations at ioeX. He obtained his masters degree from the University of Taiwan’s Institute of International Business and after graduating, he devoted himself to the cell phone industry, starting with developing and manufacturing the specifications for his own brand of cell phones. Then, he joined Hon Hai/Foxconn to engage in design subcontracting for international cell phone brands, after which, his work took him to the city of Chengdu with the orders to manage mergers and acquisitions for local software development companies, and after thus turning the subsidiary profitable, he was transferred to another subsidiary in Shanghai, assisting the company in realizing system functions and productization. In 2015, he returned to Taiwan to manage the Foxconn Group in marketing the completed system functions and products for the Taiwanese branch of the Shanghai subsidiary, where they used Taiwan as a test region to collect market feedback with which to optimize the product. 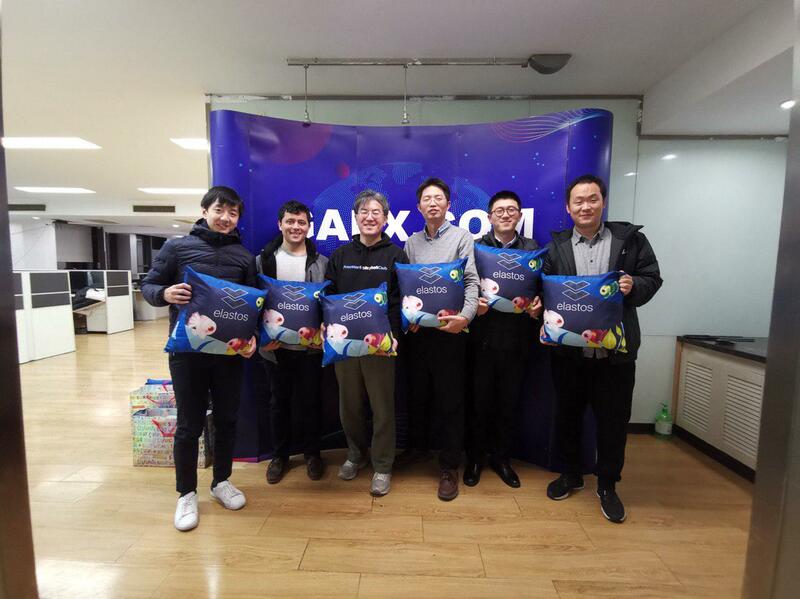 Since the end of January of 2016, when he began operating independently inside of the Foxconn Group, until today, he has established commercial internet systems, as well as IoT network communication and management systems, including front and back end, apps, databases and evolutionary algorithms for many well known domestic and international businesses. The rapidly growing number of IoT devices and their diverse range of highly mobile applications are driving an astounding demand for network transmission, which includes 1) information access and user interactions via network connections to user devices, 2) connectivity and interactions between user devices, 3) network services provided by smart device providers to support product features, and 4) software updates and other product optimizing measures provided by smart device providers. 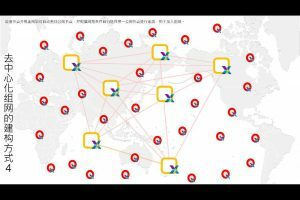 Distributed Smart-Device-Nodes as a solution. 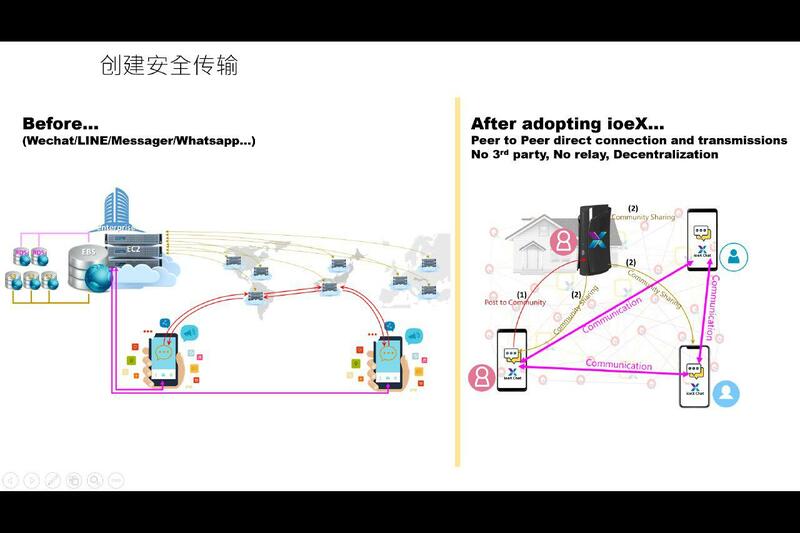 The ioeX carrier network utilizes the connections and communications between bootstrap nodes and peer nodes/phone nodes to establish a network architecture of direct communication based on the current internet and build a secure network that provides distributed storage services and data transmissions without third party intermediaries to smart device vendors, application service providers, content providers (including both individuals and teams), and even user-generated content around the world. 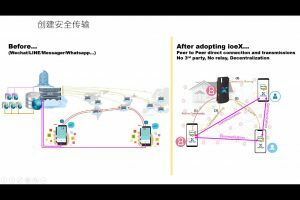 The ioeX carrier network blockchain records the workload and contributions of the nodes and provides bootstrap nodes and peer nodes with rewards and incentives in the form of IOEX, a digital currency issued through our self-owned public chain, to encourage brand owners, integrated solutions companies, CPU vendors, and original design manufacturers to adopt this business model and join its ecosystem. These rewards and incentives also increase end consumers’ inclination to purchase smart devices with P2P carrier network capabilities which then become nodes as they join the carrier network, allowing vendors, Internet Service Providers, and general users of the device supply chain to access network functionalities with IOEX coins. 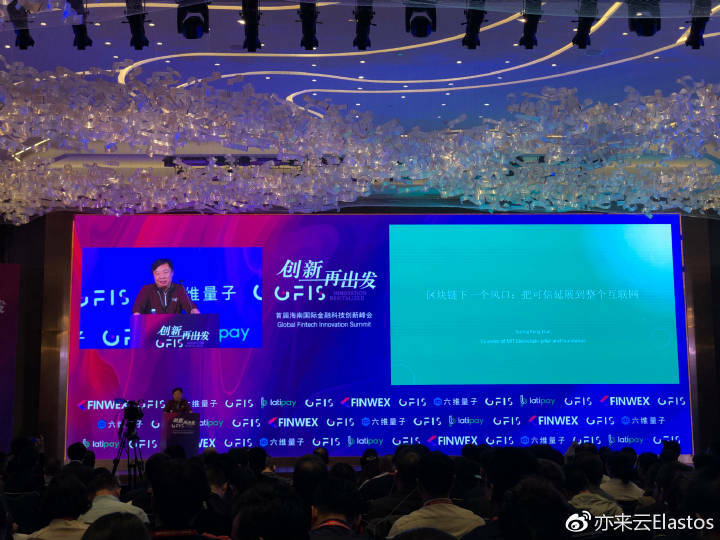 With the issuance and use of IOEX, the ioeX carrier network has thereby established a circular economy of digital currency and its surrounding ecosystem. For more information about ioeX, see Director Hung’s detailed explanation below. 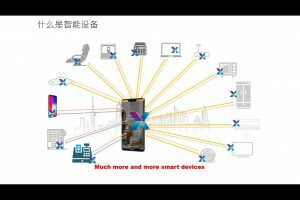 ioeX hopes to link smart-devices from around the world and turn distributed smart-devices into nodes, forming a main network capable of acting as the secure network for transmitting commercial value. This being the case, we first wish to define what a smart-device is. 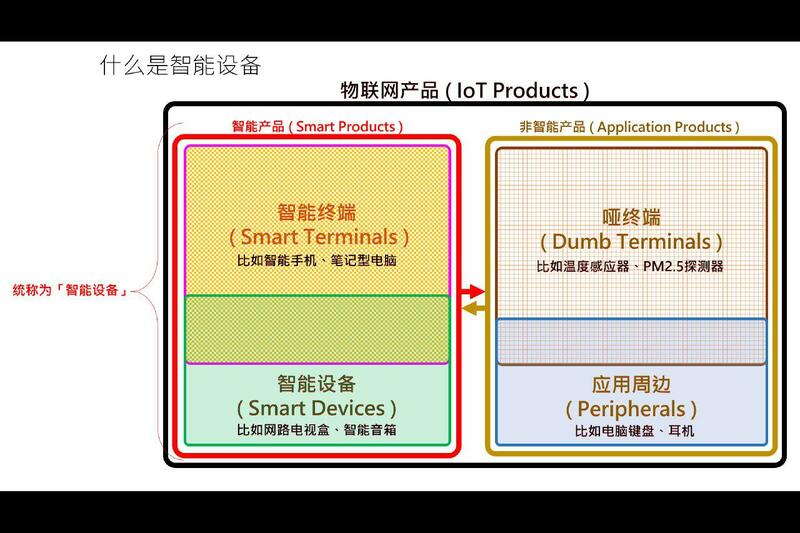 It this image, we have separated IoT network products into two categories; the first is smart-products and the second is non-smart-products. Non-smart products are things like dumb terminals and application peripherals. 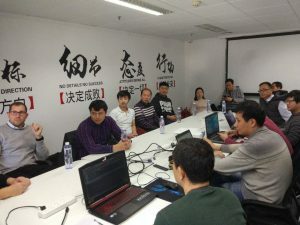 Application peripherals are unidirectional data transmission devices, such as computer keyboards， which produce inputs, headphones which produce outputs, dumb terminals, like Windows inductors, PM2.5 sensors, and different kinds of these devices. 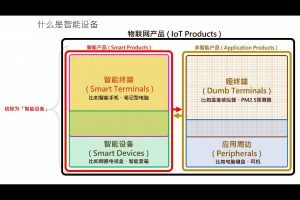 Some smart-products are called smart-terminals and some are called smart-devices. Smart-terminals are rather close to what we refer to as a mobile phone, whereas smart-devices are things like smart TVs and smart routers. ioeX’s main target is smart-products. In general, we refer to all smart-products as smart-devices. From this image, you can see that there is an increasing number of smart-devices, like smart TVs, as well other novel smart devices, like massage chairs, home electricity and the variety of smart-devices increases with the quantity available. 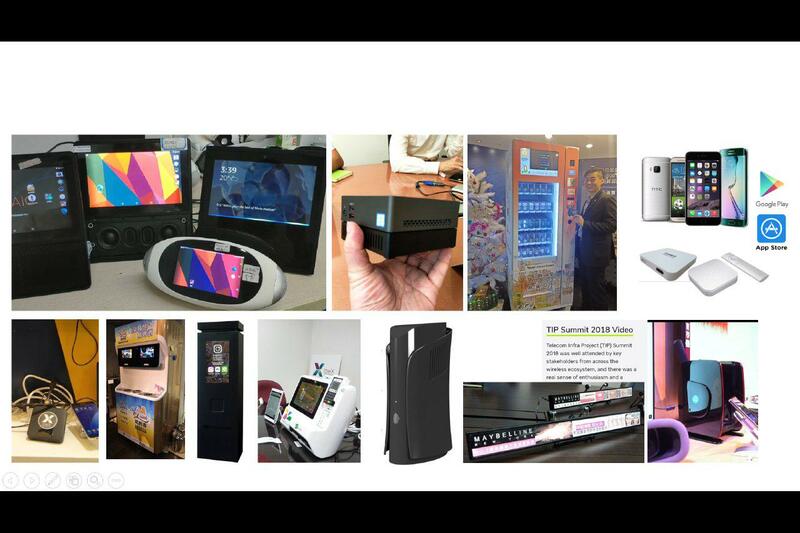 In the image above, all the pictures are of smart-devices. In addition to the cell phone in the upper right-hand corner, all these smart-devices have established official partnerships with ioeX. This includes the device in the bottom right-hand corner, which looks like a big box, but it is actually a rather small 3G/4G base station. European operators take it to rural areas to create a network, provide telecommunication services to the local residents, and can also cooperate with large-scale platforms to provide services. Later, we will turn these kinds of devices into network nodes, which are essentially small computers with an IT computer chip. They contain a programmable RF computer. For example, if you move left starting from the box on the right-side, you’ll see two lines that look like the small devices you see in a Watson’s or a convenience store–it is a long movie screen that plays movies. 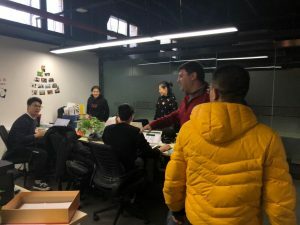 In the past, workers had to manually replace old movies played on the screen with new content using USB drives, replacing the old content with the new content in the storage space to store the movie. In the future, we hope to incorporate these devices equipped with calculation capabilities, storage capabilities and networking capabilities in the ioeX ecosystem. 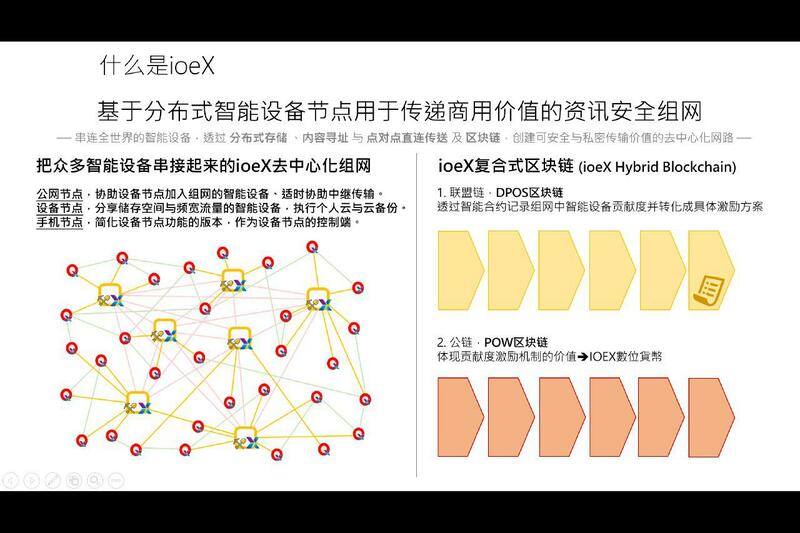 Many people ask me, “What does ioeX do?” Let me repeat what we started this presentation with: ioeX is based on distributed smart-devices nodes, which together form a decentralized network used for transmitting commercial value. 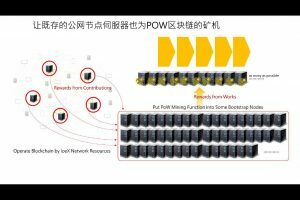 This set of mechanisms covers two major parts, one of which is the network formed by nodes and the second is made of two sets of blockchains, which are the DPoS chain and PoW chain respectively. The combination of the two blockchains through the commercial platform actually still covers centralized applications, but centralized applications will continuously become decentralized, and the pace and progress of decentralization is outlined in the white paper. 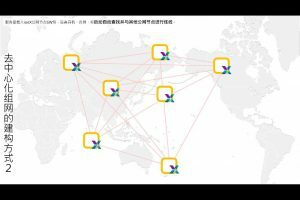 The design of the entire network is combined with Elastos Carrier. 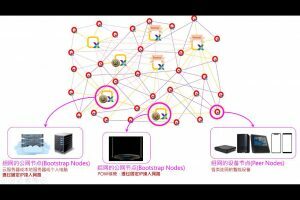 We extrapolate and apply the functions of Elastos Carrier to define two nodes, which are the bootstrap nodes and peer nodes. 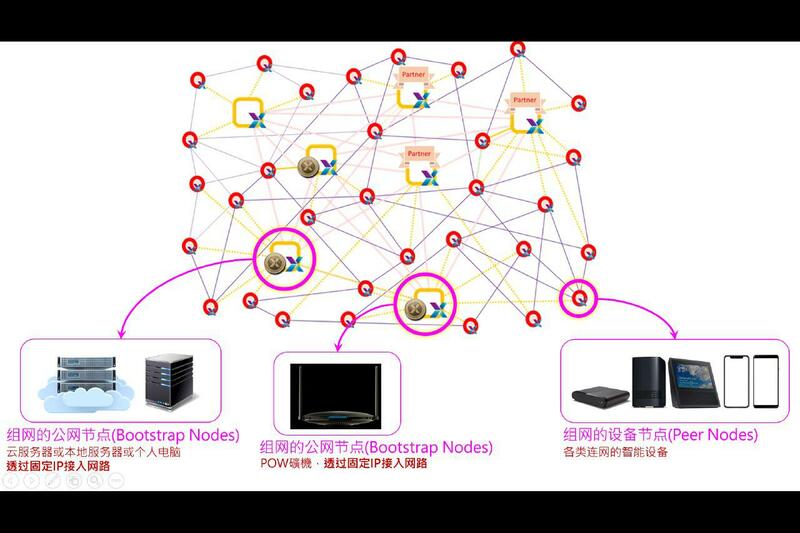 The function of bootstrap nodes are to combine through isolated IP nodes and link to the internet, providing the concept of coordinate location, and giving it to other device nodes to use. 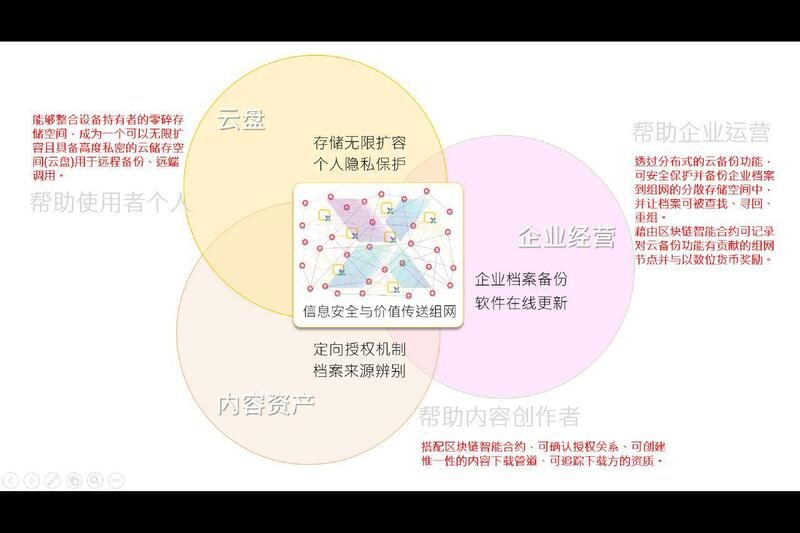 Device node refers generally to smart devices with ioeX network functions that can combine with the network through floating IPs and isolated IPs of functional nodes, forming a large-scale network, and achieving the utility of peer-to-peer smart transmissions. Another thing I often hear people ask is “What exactly is ioeX doing?” We will try to use just a few paragraphs to explain that. 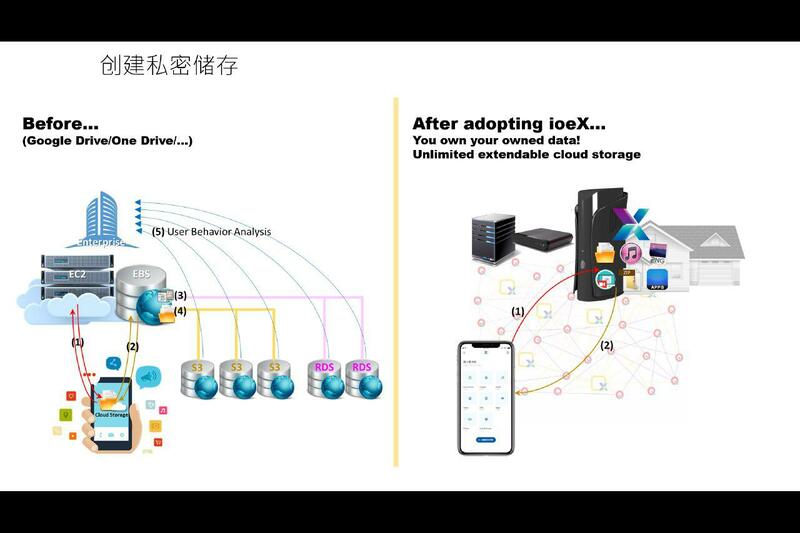 First of all, ioeX is establishing private storage features and secondly, ioeX is establishing a secure transmission mechanism. What does it mean to establish private storage? In the past, we store our documents in Baidu Cloud. Although this storage is free, the document becomes the property of the service provider after you save it there, meaning that the service provider is free to analyze the use and activity of the document, and there is still a risk that the document could be leaked. What we hope to achieve is to correlate storage space on the network with holders of device nodes, enabling private applications. 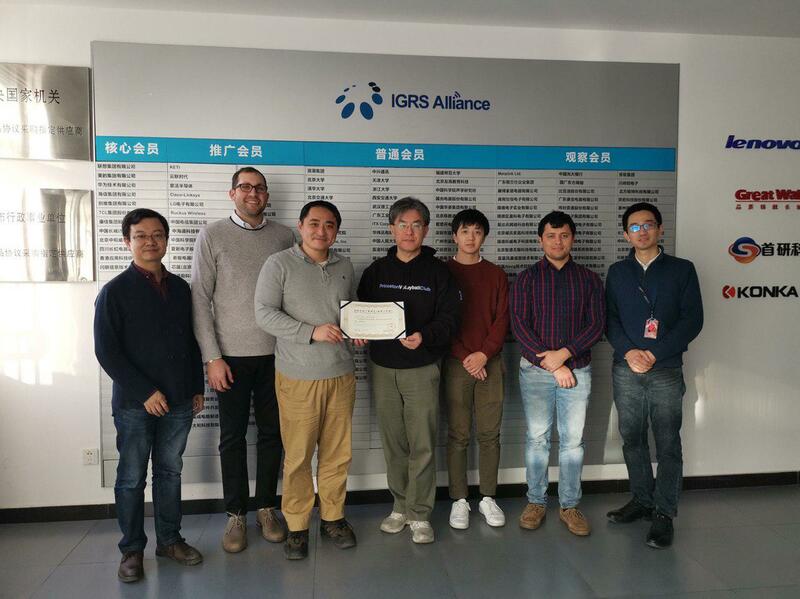 We call this capability the Cloud of The People, which is to say if a device holder has ioeX device node capabilities on his or her device, they could use the device to store content through remote backups and remote invocation. The transmission that occurs between the two is peer-to-peer and there is no third-party intermediately, and the transmission process is rather private. 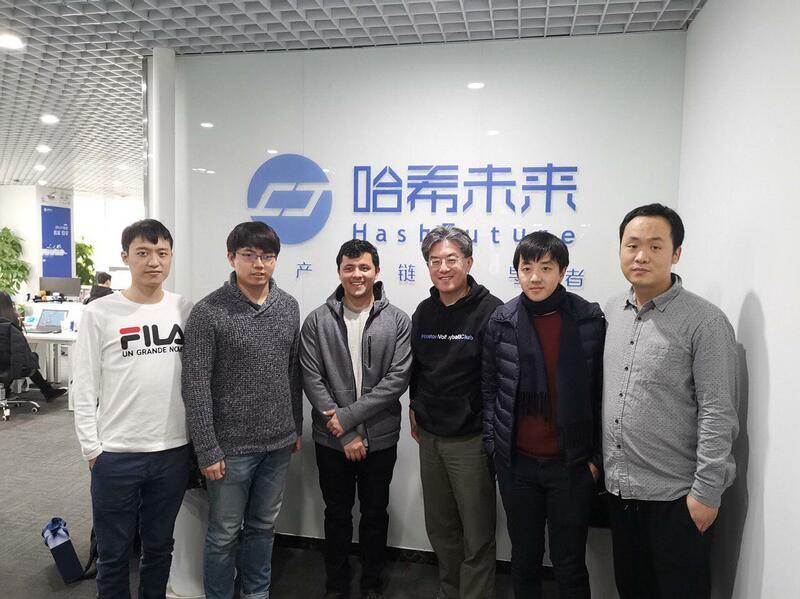 Under this definition, we hope to slowly and steadily provide corresponding functions to the extension and development process of ioeX on Elastos Carrier. For example smart-devices held by individuals can become their own, allowing them to invoke remote backups on their cloud. These clouds can essentially have limitless expansion. For example, we often talk about cell phone storage space quickly filling up, so we make backups our documents. If we were to organize that random space, that space would actually be rather large. If you could connect your internet television box, your computer, and old cell phones to the network using capabilities installed through ioeX and have them remain in a connected state, we could then invoke all the space inside. The ioeX app is a standardized feature that allows everyone it knows how to apply the SDK. After the SDK becomes open source, then everyone can use it. In this way, we hope to organize the storage space on these devices into a large-scale cloud for private individuals to use. 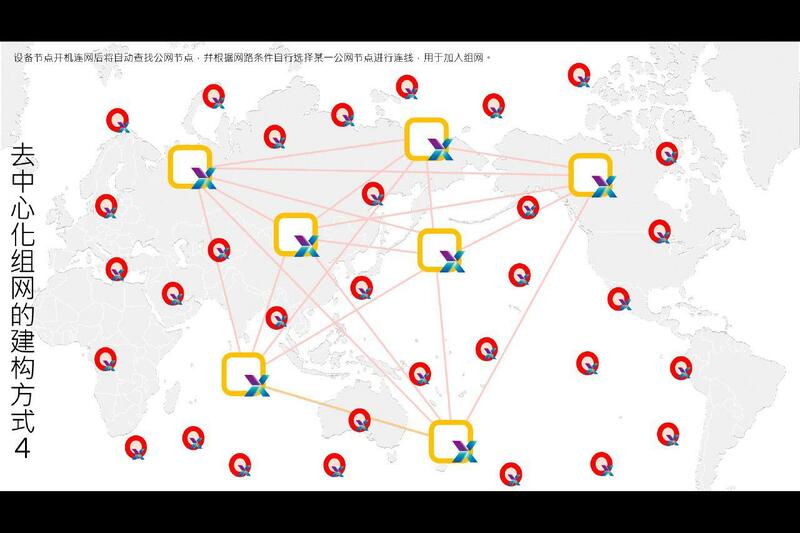 The other things is through process design, we have matched blockchain applications during the use of the commercial system, especially the application of smart-contracts, which allows the content assets of individuals to have directional authorization. So who is authorized? When a person goes to download the software, it will be recorded. Once the contents are shared with others, it will appear when those people download it. We are currently searching appropriate methods with which to tag content, in order to identify content times and purposes through smart-contracts. If the other person fraudulently uses the content, it can be tracked down. We are still discussing the matter of tagging, but the final design of the directional authorization mechanism has already been designed, and later, it will be provided for everyone to use it based on the public network capabilities. Another part to this is matching the small partitioned spaces in individuals’ cloud storage, which we call distributed backups. This backup space can only be invoked by ioeX super devices and nodes. This call mechanism makes three guarantees. The first guarantee is that the space cannot be abused and can only be for storage by a business or a content asset holder, to assist them with transmission, guaranteeing that this kind of space is essentially equipped with safety. When this space is used, the contents stored there must be compressed and cut, then backups are carried out again in multiple locations, ensuring the document won’t be restored to its original state. Under these conditions, this enables us to make the second guarantee, which is that the device can’t be infected by a virus due to a virus being brought into the space. The third guarantee is that when the content saved onto the device for more than three months, the device-holder will be able to clear the contents, or in the case that the device holder doesn’t clear it, we will automatically clear it for you in 120 days. 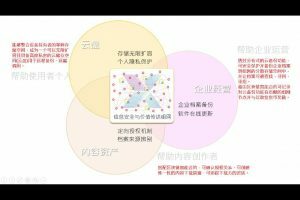 The three aspects discussed above are the three utilities that we want to achieve at the first step under so-called transmission, commercial value, and decentralized network. You can see how we form this network in the several following images. First of all, ioeX and its clients have established partners who are willing to allow us to invoke their servers. Under the premise that we are sure that their server operations won’t influence commercial applications, we can allow these devices to become nodes. 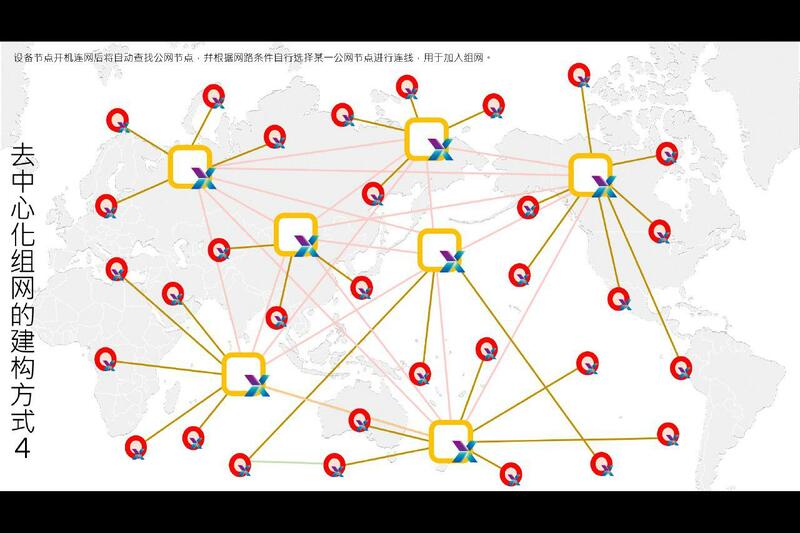 In addition to this, we will establish network nodes on each major continent one by one, allowing these network nodes to handle smart-devices for each locale, fulfilling the needs of the device nodes to join the network. As the images shows, after these network nodes are turned on and networked, they will search and connect. After smart-devices are able to allow other users to install through our partners apps or our own, and after products with ioeX device nodes installed are sold, they will spread out, forming a wide area of coverage on a geographic scale. This image shows that once these devices are online, in order for the network functions to comply with GDPR regulations, we have included a switch for these devices. We hope that the device user can maintain connectivity to the network, so we have an on switch. When it is switched on, it will be continuously connected. If it is switched off, then the connection is broken. Another switch is that after joining the network, you can agree to share the device’s storage space to enable distributed backups. 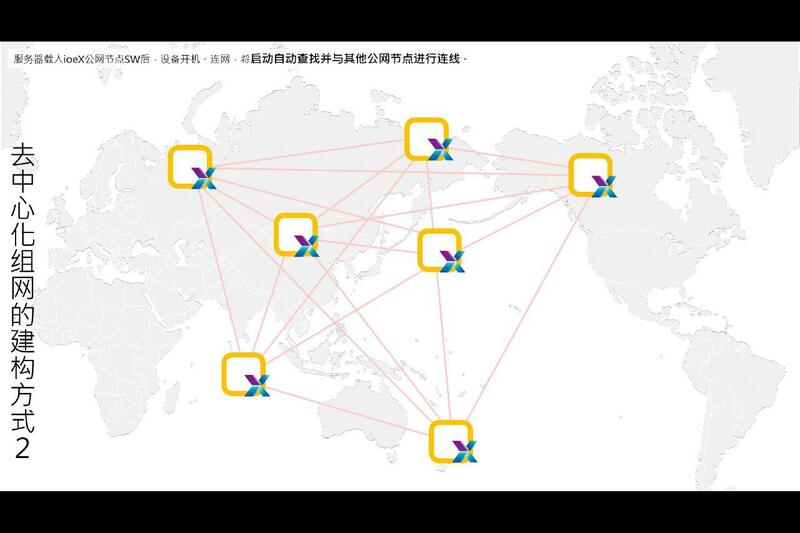 This image shows us that once device nodes integrate with the network and obtain the location of other nodes, it will begin to calculate and connect with them one by one, saving the location of the five closest nodes, then it will maintain the connection, creating a large-scale network between them. Using the network’s capabilities to ensure that distributed cloud backup space between files is temporarily stored, these temporarily stored files can be transmitted by the node and the device holder can themselves backup and call files, all in a peer-to-peer wayr. This image shows that as we set up bootstrap nodes, in addition to establishing nodes through new servers we make, we can establish new bootstrap nodes using our partners’ servers. Also, small-scale device holders will be able to either hold or use them—we hope that these bootstrap nodes will propagate to a wider geographical region because of how easy it is to both obtain and hold them. Bootstrap nodes also include ioeX public blockchain mining machines, which will help users establish the bootstrap node capabilities as part of the system. 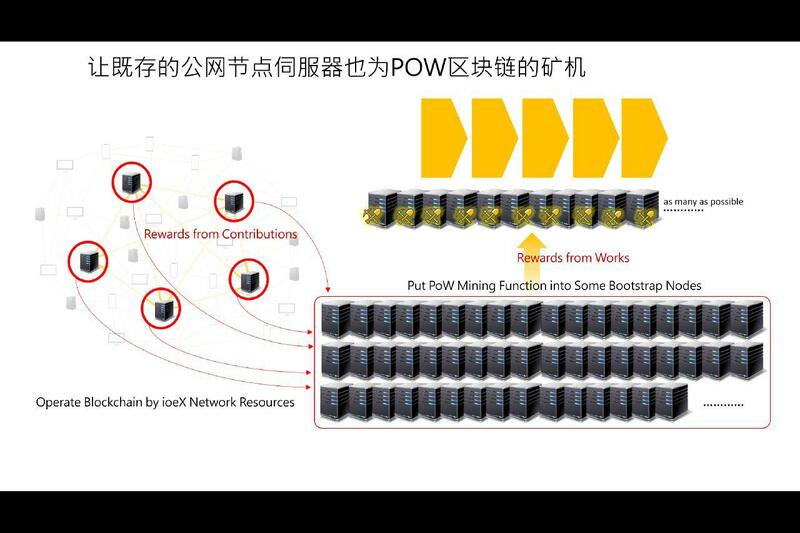 So, just as is shown in this image, our PoW public blockchain mining machines in large part come from our own mining machines, as well as from bootstrap node devices. 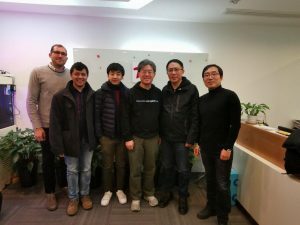 Conceptually, ioeX DPoS is a consortium blockchain. We will operate in conjunction with device manufacturers and recruited node partners. The devices used will be DPoS arbitrator devices located on bootstrap nodes on network servers, which we will operate and maintain. Pertinent node partners are mainly device manufacturers, device brands, and node partners that we have recruited. 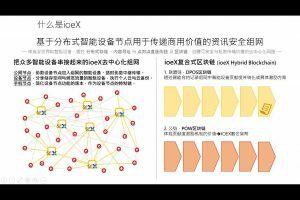 Currently, we group ioeX’s main functions into the following five categories: one – peer-to-peer direct connection transmission, person to device; two – peer-to-peer direct connection transmission, person to person; three – file storage and calls; four – distributed backups; and five – network content address search and location of target files. These are the foundational applications that ioeX can provide in its early stages. These foundational applications each will run on device apps running on Android by the end of January, and will run on device apps for mobile phones, for a total of two apps available for download on Google Play. At this time, the apps will still be in beta, so everyone can download and use them, then users will be able to submit the bugs that the find in the apps through the platform. We welcome everyone’s feedback or ideas for optimization. We will be rewarding some contributors who pose exceptional feedback and questions.